Home / Emotional Intelligence / JUST DO IT! Are you sick of putting things off! Do you go to ridiculous lengths to avoid doing things? Yes, me too. I’ve given myself a pedicure and cleaned a bit of brickwork in the garden before now, rather than just get on with it! Putting things off, delaying tactics and avoidance could of course be pure laziness but in my experience it usually goes much deeper than that. 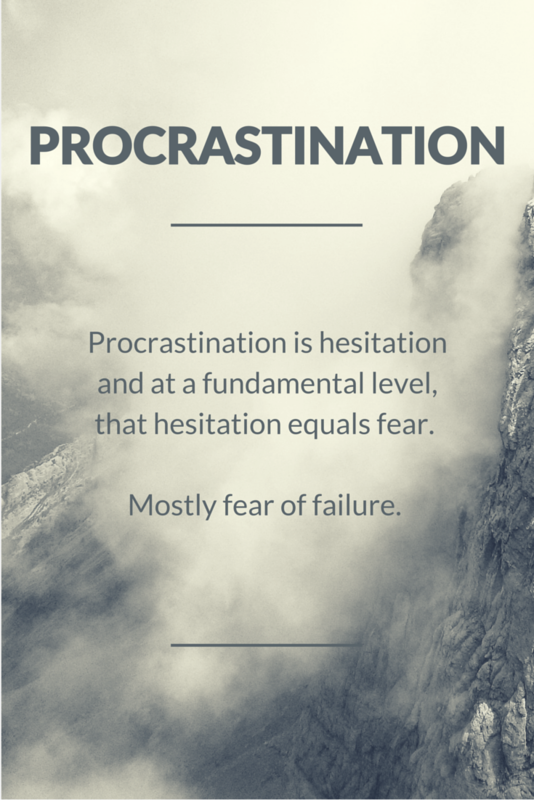 Procrastination is hesitation and at a fundamental level, that hesitation equals fear. Mostly fear of failure. If we fail then we’re not good enough and if we’re not good enough… what does that mean? Not good enough for who though? Who is the person judging you so harshly? That inner critic could be a recording of a parent trying to get you to do your homework, a teacher nudging you to try harder, or a younger you, trying to live up to a self-imposed, unrealistic, expectation. These recordings whirring away in the background of the mind, convert to ‘drivers’ of our everyday thoughts and actions. So what to do? How do we stop the self-sabotage? If it’s something REALLY big deal that you’re constantly putting off, try answering the following questions. Don’t think about them too hard just write the first few answers that come to mind … oh and you know my rule, pen to paper! Don’t just think them, or type them, write them down. 1. What will happen if I do …….? 2. What will happen if I don’t do …….? See what emerges, can you live with those outcomes? If not you’d better take some action now! Try the following ideas. I found a way around my own avoidance by setting the alarm on my phone for 25 minutes (I set it to bark!) then I have a race with myself to see how much I can get done in this time. When the phone barks, I either change the activity (to avoid boredom) or continue if I’m on a roll and doing really well. I’ve completed some really big tasks such as writing several books and launching a jazz album by approaching things in this way. If it’s a small task you’re avoiding try the “I have 5 whole minutes” approach. Can you do it in 5 minutes? Can you make a start on it in 5 minutes? Have a go, because I know once you’re up and doing, the chances are, you’ll probably keep going. The final tip might surprise you. If you’re really struggling with something, go to a mirror, look into your eyes and say (out loud if possible) I LOVE YOU (your name) YOU ARE LOVED. Then try the, “I have 5 whole minutes” approach. This helps overcome the bottomline fear, which is fear of not being good enough, fear of not being loved! Once again, don’t take my word for this, try it yourself and see the results. Thanks for taking the time to read and please pass onto your friends. Previous post: Give me some space! Next post: Does Your Life Run Smoothly Like Clockwork?